The Mt. Vernon Place United Methodist Church is a prominent landmark of Baltimore's historic Mount Vernon Place and a prime example of Gothic Revival architecture. 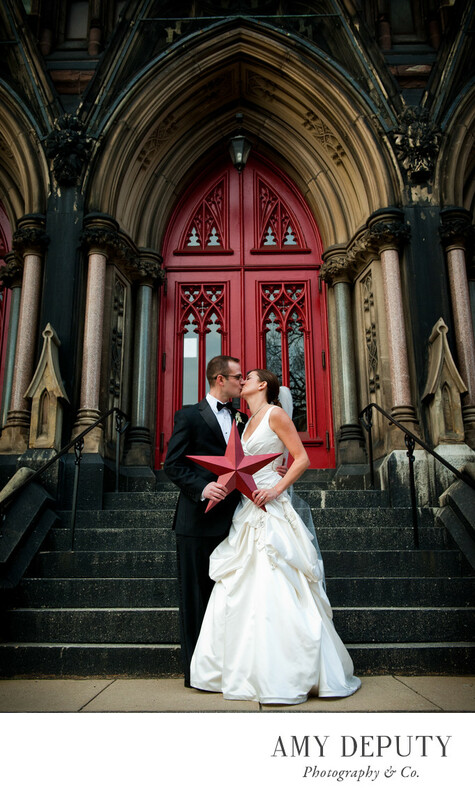 Overlooking Baltimore's Washington Monument, this 19th century church is spectacularly eye-catching with its towering spires, green-hued metabasalt exterior with brownstone detailing and ornate carvings accented by a trifecta of bright red doors. Photogenic inside and out, the Mt. Vernon Place UMC is a magnificently grand Baltimore wedding venue; a place that so perfectly recalls the reverence of sacred vows. It's a Baltimore classic. Location: Mt Vernon Place United Methodist Church: 10 E Mt Vernon Pl, Baltimore, MD 21202.